We've put together a new common tune list for 2016 and 2017, again across multiple styles, based directly on your suggestions over the last 3 years of the Fiddle Hell online survey. There were more than 500 great suggestions on the survey (thank you all! ), and narrowing them down to just 52 has been a challenging and interesting process. We think you'll really enjoy the tunes on the new list! Just as on the original list, you probably play some of them already, and you may see a few that you personally suggested. Some of these tunes will be featured at Fiddle Hell in November, 2017, at workshops, jams, and flash mobs. The Reiner Family Band recorded the new common tunes (played both fast and slow) on a new 2-CD set, which is available in our Store. Jolie Blonde (Cajun waltz in A) P. D.
Skip back up to the New Common Tunes. Since I write fiddle books, I'm certainly not opposed to sheet music in general. And quite a few of the common tunes on the Fiddle Hell 2-CD set are also in my book Anthology of Fiddle Styles. If you're new to fiddle, I'd guess there are a couple of songs that you can sing or hum, like Happy Birthday, or Twinkle, Twinkle Little Star, or others, and that you could play these by ear on fiddle with a little experimentation. Try it! It's just a matter of developing this ability with fiddle tunes. 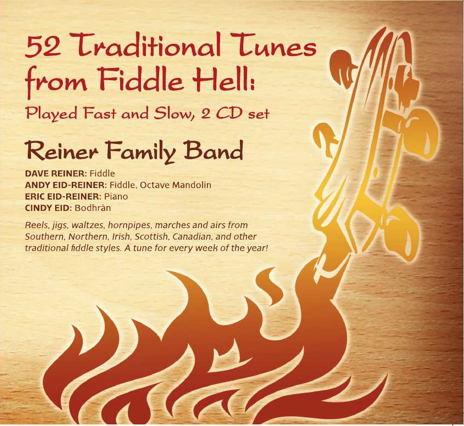 If you listen to and try singing or playing along with your favorite fiddlers or with the Fiddle Hell repertoire CDs (which include slow versions of the tunes), you'll eventually have some of those tunes in your head. Then you can sound them out on your fiddle. I know it's hard at the beginning, but it'll get easier over time. Even if you track down some sheet music for a tune, that may not be the version that's commonly played, so listening and playing by ear is still preferable. And even if you can play what's on the sheet music perfectly, it may sound mechanical and you'll be tied to it unless you take the additional step of learning it by ear. Here's my personal experience. I've learned some tunes by ear and some from music. The ones that I'm most comfortable with and that sound the best are almost always the ones I picked up by ear.